Aluminum Casting Market Size Worth $97.36 Billion by 2025 | CAGR: 7.8%: Grand View Research, Inc.
NEWS PROVIDED BY: Grand View Research, Inc. According to report published by Grand View Research,The global aluminum casting market is projected to reach USD 97.36 billion by 2025 . The replacement of iron and steel components in vehicle with lightweight aluminum in order to increase the fuel efficiency of the vehicle is expected to drive the market over the forecast period. 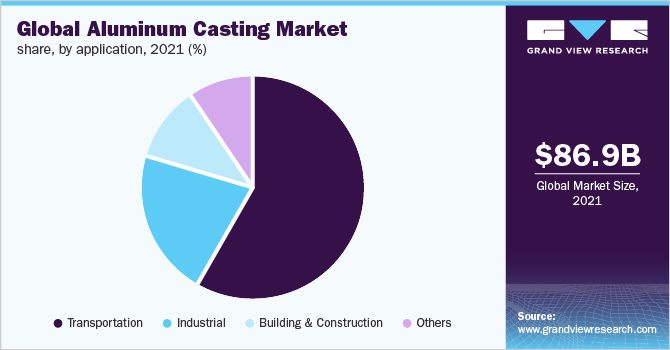 The global aluminum casting market is projected to reach USD 97.36 billion by 2025, according to a new report by Grand View Research, Inc. The rapid shift in trend of using aluminum by replacing heavy metals such as iron and steel in the automotive industry, along an increase in the use of aluminum in the construction industry is further boosting the market growth. Aluminum casting has gained huge popularity due to its strength and lightweight features are anticipated to develop the industry. The continuous increase in demand for aluminum casting in the automotive industry, in order to improve fuel efficiency and by that reducing CO2 emissions is a major driving factor for the industry growth. Die casting process has high efficiency, and can be casted into more variety of shapes and size than any other casting processes. Aluminum dies casting is widely used in automotive sector for manufacturing of parts such as engine cylinders, engine blocks, gears, flywheel, wheel spacer etc. The transport industry is expected to be the largest end-use segment by 2025. The growth in this sector is attributed to growing demand for lighter vehicles globally for better fuel efficiency. Automobile manufacturers are also under a burden of regulatory guidelines to curb CO2 emissions from their vehicles. One of the basic ways is to replace heavy metals like iron and steel with lightweight aluminum. This regulatory trend is expected to be one of the biggest drivers for aluminum casting industry. Asia Pacific was the leading region due to its rapidly growing population, which in turns generating demand in housing and automotive industry. The availability of a many aluminum casting options and ability to customize the product according to the need is leading to the growth of the overall market in this region and globally. The market is expected to grow at a CAGR of 7.8% from 2017 to 2025 on account of increasing production as well as demand for lightweight vehicles. Transportation is projected to have the fastest growth in terms of revenue at a CAGR of 8.1% from 2017 to 2025 owing to stricter emission standards by global regulatory authorities. Asia Pacific market is expected to witness substantial development and was valued at USD 21.13 billion in 2016 owing to its growing automobile and construction sector. Key participants include Alcoa, Alcast, Ryobi, Dynacast, Consolidated Metco, Martinrea Honsel, Gibbs Die Casting and others.